Incognito Lingual braces in Kingston, London. Available 7 days a week. Incognito Lingual braces are one type of Lingual orthodontic treatment. The unique thing about an Incognito brace is that the brackets are fixed behind the teeth. Due to this, they are virtually invisible to other people. For patients who want to improve their smile and straighten their teeth but feel uncomfortable with the thought of wearing traditional fixed braces, Incognito is one of several options available. Other potential options for discreet tooth alignment include damon clear baces, Invisalign, Six Month Smiles, or Fastbraces. Those who choose Incognito braces will receive a bespoke set of wires and brackets manufactured by state of the art technology. As with other types of Lingual braces, Incognito braces are bonded to the back of the teeth to make them as discreet as possible. Friends, family members, and colleagues are extremely unlikely to notice that the patient is wearing braces at all. This gives Incognito a considerable cosmetic advantage over other forms of orthodontic treatment. 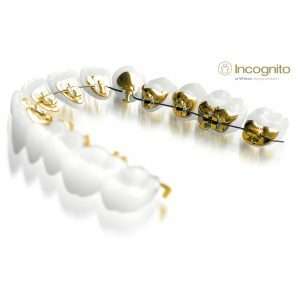 Incognito braces are suitable for all age groups, including adults, children, and adolescents. Some people who wear Lingual braces notice a temporary change in the way they speak and may notice lisping. However, this tends to subside relatively quickly as the tongue will soon adapt to the change. Of course, there are numerous other treatments available to people who wish to straighten their teeth without unsightly metal wires, such as Invisalign. Similar to Incognito Lingual braces, Invisalign aligners are cosmetically superior to traditional braces due to their near invisibility. However, they have the additional advantage of being completely removable. This means patients can eat and drink whatever they want during treatment, as well as brushing and flossing without difficulty. We provide 0% Finance on all orthodontic treatments allowing you to spread the cost of your treatment without paying interest or you can pay as you go for the cost of your treatment. Pearl Dental Clinic is open 7 days a week from 9am to 10pm. You can book an Incognito Lingual braces consultation with our Specialist Orthodontist by calling us on 0208 547 9997 or emailing us or booking an appointment online (24 hours).